Tacoma Firelogs are a 100% recycled product, produced from planer shavings, sawdust, hog fuel, and other remaining wood items cast off in the wood remanufacturing process. The firelogs weigh only three pounds each, but produce over 8,000 btu’s per pound. The logs burn hot because of the low moisture content, and cleanly because no wax binders are used in production. What you get is an environmentally friendly log that is produced using only recycled wood. The low moisture content in each log allows energy to be released as heat, not as extra carbon from wax binders, or dangerous creosote buildup from cordwood. 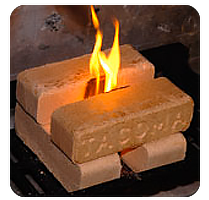 Every box of Tacoma Firelogs comes with 8 Firelogs and two Mini-Nugget fire starters. Each log measures approximately 2 3/4″x3 1/4″x9 1/2″. The box weighs approximately twenty-four pounds, so it is easy to lift. Tacoma Firelogs will burn for 1 to 2 hours in an open fireplace or fire pit. In a properly vented woodstove, the firelogs can burn for 4 to 6 hours.